Gov. Jay Inslee's task force on southern resident orca recovery released its first recommendations Friday to help Puget Sound's orcas, on the brink of extinction. 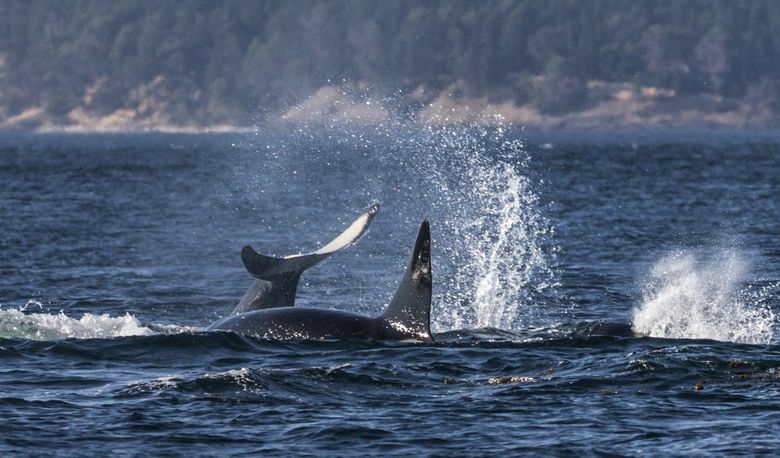 From dam teardowns to a temporary moratorium on whale watching of southern residents by any boat, a governor’s task force on orca recovery released its first round of recommendations Friday. Task-force members said at a news conference at the Seattle Aquarium that bold action is needed to save the critically endangered population of killer whales from extinction. Only 74 southern resident orcas remain. The recommendations will depend on significant new funding from the state Legislature as well as new legislation to take effect, so the wish list is a long way from becoming reality for the whales. Among the biggest changes called for is a 3- to 5-year moratorium on whale watching by any boat of the southern residents, to provide quieter waters for them. Some of the most controversial issues considered by the task force were put off, including breaching of the Lower Snake River dams. The busting of those dams — to support bigger returns of chinook salmon, orcas’ primary food — was the most broadly supported ask put forth in public comments to Gov. Jay Inslee’s task force. The task force demurred, putting the issue to a study committee, but did single out two dams for removal within two years in Puget Sound: a dam on the middle fork of the Nooksack River and a dam on the Pilchuck River. The task force also called for better enforcement of existing regulations to protect the whales. A total of 36 recommendations after six months of work are intended to increase chinook runs, decrease noise from vessels and reduce exposure of orcas and the salmon they eat to contaminants. The task force also called for increasing the spill of water through the Columbia and Snake River dams, widely regarded by scientists as one of the best early steps that can be taken to help boost salmon survival. The task force also supported funding to determine how to re-establish fish passage above the Chief Joseph and Grand Coulee Dams on the Columbia River and on the Tacoma Water Diversion, Howard Hanson and Mud Mountain Dams in Puget Sound. Typical strategies include trapping and trucking fish around dams or fish ladders. Boosts in hatchery production were also supported by the task force, where that doesn’t impede wild chinook recovery. The focus on prey was driven by the orcas’ biggest need: access to adequate, high quality food, especially chinook, the orcas’ preferred fish. Rob Williams, a Seattle-based biologist at Oceans Initiative, a science non-profit, studies orcas on both sides of the U.S.-Canada border. He found in a recent paper published with other colleagues that the southern resident population needs about 662 large chinook every single day to meet their calorie requirements. “That needs to be the new normal,” Williams said in an interview. That is a 30 percent increase in chinook abundance above average levels. However, that increase could be cut to 15 percent if vessel noise also is reduced by half. Otherwise, the populations will continue to decline and there is a 25 percent chance the whales will be lost within 100 years, the scientists found. Whether the recommendations from the task force go far enough to achieve recovery of the southern resident population can’t be discerned because of a lack of scientific analysis so far of the probable results from the recommendations, Williams said. He said he hopes a deeper dive into modeled predictions of the results could help policymakers understand if the recommendations go far enough. Other experts said they are already convinced the task force fell short. “Frankly, I am embarrassed for the conveners and participants of the Orca Task Force who had to endure blatant and ill-informed political manipulation of a process launched with the good intention of doing something bold to help recover the Southern Resident Killer Whales,” Ken Balcomb said in a statement. The task force member and founding director for Center for Whale Research criticized the partial moratorium on whale watching saying the “meaningless moratorium” skirts the major problem facing the whales: salmon population declines throughout the whales’ range. “The whales are on their own in their downward spiral toward extinction along with the natural wild runs of Chinook salmon the we used to call ‘King,’ ” he said. Both the provision to increase spill at dams and reduce vessel noise can if enacted provide the orcas with some immediate benefit, Gaydos said. In a time of political division and poisoned civic discourse, the more than 40 members of the task force also managed to stay at the table and come up with recommendations despite sharp disagreements between them, Gaydos said. “The orca urged us on … to achieve what many said was impossible,” said task force co-chair Stephanie Solien of the task force’s effort. Among the recommendations that will require legislative action are a half-mile go-slow zone around all southern residents, reducing vessel speeds to 7 knots or less, and an increase in the distance kept from the whales to 400 yards from 200. The moratorium on whale watching of the southern residents by all boats also will require legislation. The moratorium, already opposed by whale-watch representatives on the task force, promises to be a fight in Olympia, if it gets that far. Whale watching on all other species including Bigg’s, also known as transient, killer whales would be unaffected. Inslee said in a prepared statement he will review the recommendations in the coming weeks and assess them as he puts together his budget and policy priorities in mid-December for consideration during the 2019 Legislative Session. The task force must deliver a second report outlining the progress made toward orca recovery, lessons learned and outstanding needs to be completed by Oct. 1, 2019. With the submission of its second report, the task force will be dissolved.